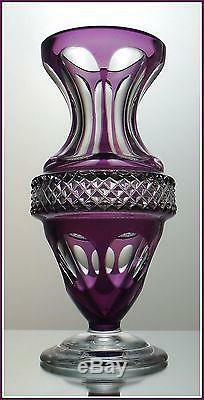 Presented for your consideration is a stunning cut-to-clear crystal pedestal vase in a lovely bright AMETHYST / PURPLE / PLUM / GRAPE / VIOLET / LAVENDER. Cut into the mouth blown piece are six long cameo panels and six large coin dots separated by a diamond pattern band. The upper edge is 1/4 inch thick and has been polished smooth. The clear base is tiered. 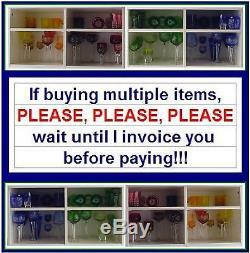 This heavy full lead (24% PbO) crystal vase is a vintage piece manufactured for WMF Cristal Cabinet in Bavaria, Germany. It is in excellent condition. Scratches, nicks, dings, chips nor repairs. Diameter rim: 3 3/8 inches. Diameter at widest part: 3 3/4 inches. Diameter base: 3 1/8 inches. Weight: 1 pound, 11.8 ounces. Please be assured that I will pack this piece with the utmost of care in tissue paper and bubble wrap to make sure that it arrives safely in your home. And been scouring the flea markets for over 30 years. I have been mailing packages internationally for longer than that. Beautiful piece of German crystal is sure to please. 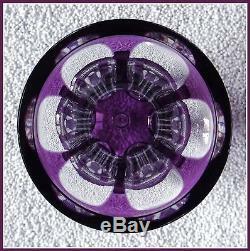 The item "AMETHYST PURPLE Pedestal Vase CUT TO CLEAR 24% Lead CRYSTAL Bavaria Germany WMF" is in sale since Sunday, March 27, 2016. 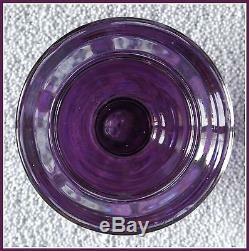 This item is in the category "Pottery & Glass\Glass\Glassware\Amethyst". The seller is "europeanvintagecrystal" and is located in Berlin.